When meeting the student face-to-face, one sets a tiger trap. releasing both and gathering both in. Knowing how to play with a dead snake is a matter for outstanding masters. Yantou asked a monk, "Where have you come from?" The monk said, "From the western capital." Yantou said, "After the rebellion of Huang Chao had been suppressed, did you get the sword?" The monk said, "Yes, I have got it." Yantou stretched out his neck before the monk and let forth a great yell. The monk said, "Your head has fallen." Later, the monk visited Xuefeng, who asked, "Where are you from?" The monk said, "From Yantou." Xuefeng said, "What did he say to you?" Xuefeng gave him thirty blows and drove him out. i.e., Chang'an (present-day Xi'an), western capital of the Tang Dynasty. He is defeated before he even opens his mouth. Yantou is boring into a skullbone. If you want to know where he's coming from, it's not hard. After all, he's a petty thief. Yantou has never been a petty thief. He doesn't fear losing his head, so he asks such a question: he's very courageous indeed! He's defeated, but doesn't know where to turn. Ignoramuses are as plentiful as hemp and millet. He must know what's appropriate to the moment, to do this. This is a pitfall to catch a tiger. What is going on in his mind? He only sees the sharpness of the awl; he does not see the squareness of the chisel. What good or bad does he know? He's struck! No patchrobed monk in the world can do anything to him. He completely fools everyone in the world. No one can find out where this old fellow's head has fallen. As before, he is fatheaded and stupid. This monk is thoroughly defeated time and again. He cannot but tell where he comes from; but still Xuefeng wants to try him. After all he is defeated. If he can recite it, he won't avoid getting hit. Right then he should be driven out. Although it is true that he cuts ails and shears through iron, why does he only strike thirty blows with his staff? He hasn't yet gotten to the point where his staff breaks. This is not yet the real thing. Why? "Three thousand blows in the morning, eight hundred blows in the evening." If Xuefeng were not a fellow student with Yantou, how could he discern the point? Although this is so, ust tell me, where do Xuefeng and Yantou abide? Why the laughter, the master knows. One has to be an adept to recognize the roar of laughter. To take the advantage is to lose the advantage. 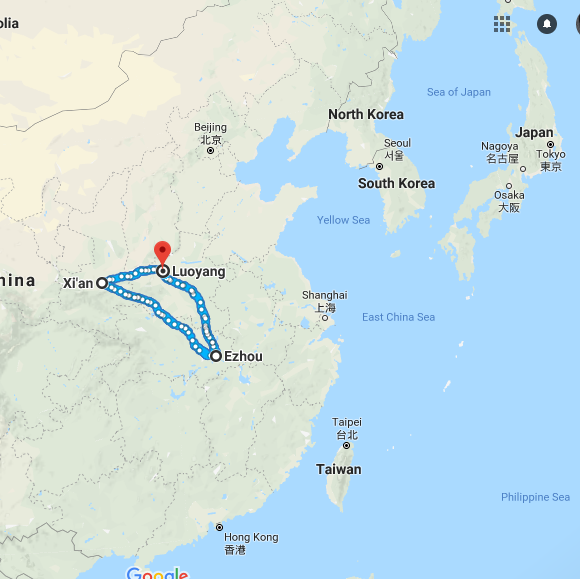 Luoyang [400 km east of Chang'an] was called the eastern capital, Chang'an (present-day Xi'an) the western. At the time of this case, Chang'an was the capital. At the time of the decline and fall of the Tang Dynasty the central government, in an attempt to tide over a financial crisis, tried to levy unjustly heavy taxes. Riots broke out. Huang Chao was the leader of a rebellious faction. It is recorded in a chronicle that "an object fell from heaven. It was found to be a sword, which bore the inscription, 'Heaven gives this to Huang Chao.'" From then on, Huang Chao's group developed into a powerful force. In 880, Huang Chao seized Chang'an. Emperor Xizong of Tang [b. 862; reigned 873-888] fled from the imperial palace, and his relatives who failed to escape were massacred. Huang Chao was killed four years later, and his followers were subjugated. But other riots followed throughout the country. Towns and villages were plundered, and the unrest accelerated the fall of the Tang dynasty. 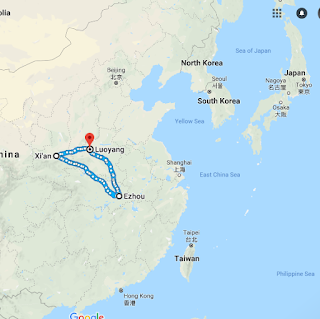 Yantou's temple was located at Ezhou, Hubei, far from [830 km southeast of] Chang'an, but it was nonetheless raided by rioters. Finding nothing worth stealing, they stabbed Yantou with a dagger. As he died, he gave a great shout, which is famous as "Yantou's shout." This took place in Apr 887, when Yantou was fifty-nine. The story of the present case must have occurred between Huang Chao's execution in 884 and Yantou's death three years later. When Longya Judun (835-923) was travelling on foot, he posed this question to Deshan Xuanjian (782-865): "How is it when the student wants to take the Master's head with a sharp sword?" Deshan stretched out his neck, approached, and said, "Yaa!" Longya said, "The Master's head has fallen." Longya later recited this to Dongshan Liangje (807-69). Dongshan said, "What did Deshan say at the time?" Longya said, "He said nothing." Dongshan said, "His having nothing to say, I leave aside for the moment: just bring Deshan's fallen head for me to see." Longya at these words was greatly awakened; later he burned incense, and gazing far off towards Deshan, he bowed and repented. A monk repeated this to Deshan. Deshan said, "Old man Dongshan does not know good from bad; this fellow has been dead for so long, even if you could revive him, what would be the use?" Touzi Datong (819-914) asked a monk from Yanping, "Have you brought a sword?" The monk pointed at the ground with his hand. Touzi said, "For thirty years I have been handling horses, but today I have been kicked by a mule." This monk's eyes were like comets, yet he was still thoroughly exposed by Yantou, and pierced all the way through on a single string. If yu travel on foot like this, the King of Death will question you and demand you pay your grocery bill. This story has a knotty complication in it. Although this matter has neither gain nor loss, the gain and loss are tremendous: although there is no picking and choosing, when ou get here, you after all must possess the eyes to pick and choose. In his laugh there is poison: if any one could discern it, he could travel freely throughout the world. The monk in the exchange with Touzi ("Related Tale 2") was undeniably an adept -- neither did he say he had it, nor did he say he did not have it; he was like an ocean away from the monk from the Western Capital. "Go ahead and kill me!" Even though the monk was a good-for-nothing, Yantou decided to try him out. Fool! Idiot! Should have laughed here instead! Was he jeering at the monk, or is there a subtler significance? This is a cold laugh! What about this action? Very lenient indeed. Recognizing the sword of knowledge that everyone has means decisive certitude with precise accuracy. If you are told this very day your eyes are horizontal and your nose is vertical, so be just as you are, you may think it sounds reasonable, but you are not really sure, so you revert to wondering whether there might not be something else; this is what is called a blunt sword. Uh, oh! He's faking it! "If you have it, come roaring up and cut off m head!" A blunt sword won't cut through bone. This monk failed to make the kill. Is this approval? Is this disapproval? There is a sword in the smile. -- with a look of self-congratulation on his face. Let's hope this monk can tell pain from itch. The monk stretches the simile of the sword too far, for Zen (or "enlightenment") is nothing you can get hold of. Instead, the monk could (a) point his finger in front of him and say, "Just now the sword was there. It's gone somewhere." Or (b) say, "Such a piece of junk! I threw it out." Yantou ridicules the monk's "sword" conception of Zen. Instead the monk could take a leap back and, as if in dread, say, "Oh, that's danger! That's danger!" By beating the monk, Xuefeng proves that he understands what Yantou found lacking in the monk. This sword is something which everyone has innately. But unless he is enlightened, he is unaware of it. Yantou was asking the monk whether he had become aware of the sword. Yantou's gesture meant, "If you have got the sword, try it on my head." It was a demonstration of Yuanwu's "displaying the spirit to capture a tiger," and it was also a combination of a frontal and a flank attack, of holding fast and letting go. Invited to say this, he said it. There is no originality whatever. But the monk seems to have mistaken it for a success and, puffed up with it, went to Xuefeng. The laughter was a demonstration of holding fast and letting go. But the monk did not understand. The monk deserved to be kicked out. 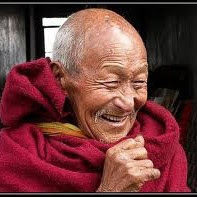 The unnamed monk in this subject is undoubtedly one of the large number of men who in the Tang period went round trying to sponge on the hospitality of Zen temples by pretending that they knew the secrets of absolute knowledge. The great Zen scholars, however, easily saw through the false pretensions of such men. Although Huang Chao is dead, the sword remains. It is the sword of our essential nature. Yantou is asking, “Have you attained realization? To say that you have obtained the sword is proof that you have not really obtained it yet! A better response would have been for the monk to give Yantou a resounding slap in the face. It’s a bit rough, but it’s one example. If this is a real crossing of swords you have to be able to produce the sword itself on the spot. Another possibility is as follows: “You mean that sword? I threw that away in the garbage a long time ago.” That seems to be even better to me. “So, if you have picked up that sword, show me what you can do with it!” Yantou seems to say as he sticks out his neck and cries “Ka!” in a loud voice. 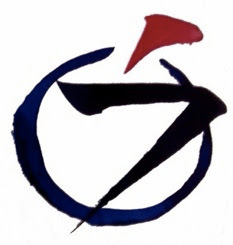 This cry of “Ka!” can have various meanings depending on how it appears in a Zen text. Here it means something like “Go ahead and cut!” Here is the tiger’s trap, here is the scheme for catching the bandit. Now the monk has descended to the level of curbside theatrics. Yantou cannot hide his bemusement. But where does this laughing come from and where does it go to? “Where does the light go to when it is extinguished?” There is poison in that laughter! Xuefeng's action is the height of sincerity. a pit for a tiger, surprise for a thief. He knows where he comes from, but he will not tell. and demand that you pay up your bills. but today I've been kicked by a mule! he'll need to wake up on his own. How is it when the student wants to take the Master's head with a sharp sword? You were there, or heard about it. Your teacher answered by stretching out his neck. The Master's head has fallen, said the student. Now your old Master is ten years dead. You've moved away and are a Master yourself. Did you get the sword? you ask. Ah. He's heard the story. You laugh as your head rolls across the floor.